Praying Mantis Dreams by A.
Praying Mantis Account by Simon Parkes. Having read Jim's accounts which I can say are true as I can back up some of the stuff he experienced: for example, the circular download of data that he got, only what I experienced contained not just oblong shapes, but squares and triangles as well. So I just wanted to share one of my experiences with the mantis aliens with you. I am lucky enough to be supported by an experienced "UFO" investigator who is guiding me through my realization that for some 50 years I have been around these beings. The memory that I wish to share took place in a house that I lived in between 1964 and 1981, this was an old house, which was built around 1890 - 1900. I remember walking along the rather long corridor toward the kitchen to make my evening cup of tea when I saw another corridor which should not have be there - it ran parallel to the real corridor and disappeared into the back of where the garden should be - I followed it along and as I did so I saw two identical children walking down this corridor toward me. One of them held the hand of one of these creatures. 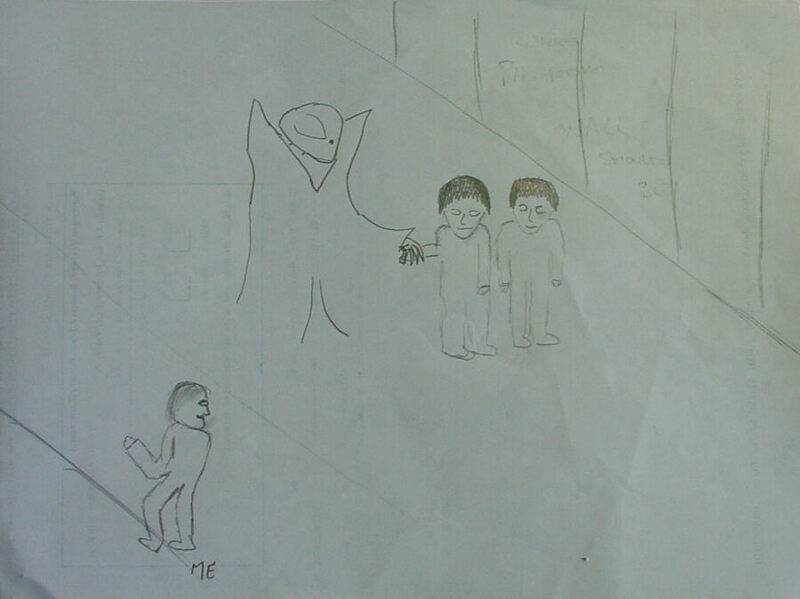 I have attached a drawing of what it and the children looked like. As we approached each other we all stopped, the mantis creature did not look at me, but the two children did. They were not distressed or un-happy, they were not first timers to this. They were either hybrids or twins, they were so much alike, we just stared at each other, unfortunately I don’t remember if we communicated, we must have - but I just don’t remember any at present. Then we walked on, I went into a large room, laid out like a museum, on the wall was a huge viewing screen on which I saw an image - after which I left. These mantis are very proud creatures, they are very confident and commanding, they are very technical and think like a chess computer, the ones with the purple robes are the most senior and are very strict. My earliest memory with them goes back to when I was about 6 months old, so I feel I know them very well.